AleaSoft, July 12, 2018. The price of Brent futures plummeted around 7% in a few hours, and reinforced the mistrust feeling of a new global crisis. AleaSoft sees possible that the prices of fuels, gas and coal, and CO2 emissions are also dragged down. Yesterday, Wednesday July 11, the price of the futures of Brent oil, the reference in Europe, fell sharply by 6.9% down to $73.4 a barrel, after having been recording daily rises in recent days, even it was expected that it could exceed the $80 barrier before the end of the week. 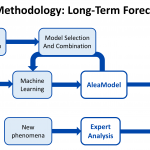 The main cause seems to be the pessimistic climate about the fear of a global crisis, according to AleaSoft, due to disagreements between the main world economies and between oil producers. The price of fuels for the generation of electricity followed an upward trend during the last seven days, accompanying the rise of the Brent oil before the sudden collapse. The price of coal increased by 2.8% in the last week and has already exceeded $100 per ton. Meanwhile, in this same period, the price of CO2 emissions registered an increase of 4.1%, and once again it is above 16 €/ton. Faced with this situation, AleaSoft sees plausible that the fall of the Brent price of Wednesday, July 11, will drag down the price of gas and coal, and of CO2 emission rights. The behavior of fuel prices and CO2 emissions in recent days pushed up electricity futures. Q4-18 product of the Spanish electricity futures market OMIP closed on Wednesday, July 11, at 66.42 €/MWh, 1.32 €/MWh more than seven days ago. 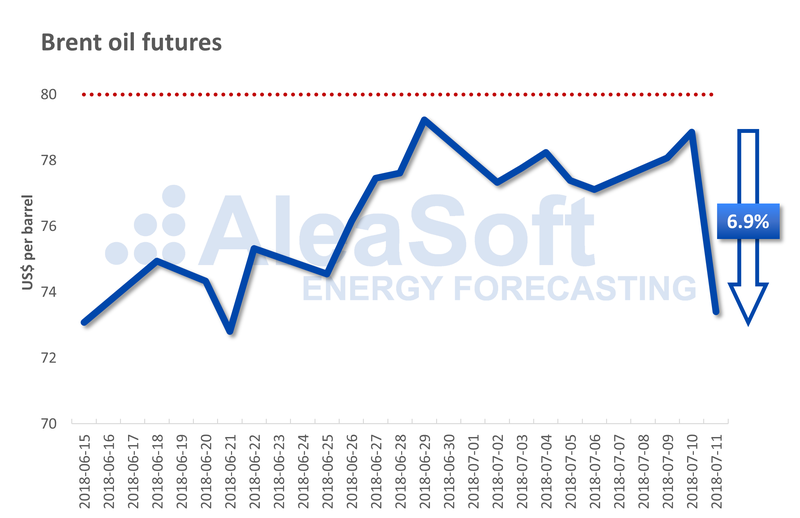 According to AleaSoft, the price of electricity futures can relax if, as expected, the price of fuel and CO2 emissions decreases. During the last days there has been a significant increase in temperatures in what could be the first heat wave of this summer. On Tuesday, July 10, an average temperature of 25.5°C was recorded in mainland Spain, 2.1°C above the historical average for this time of the year, according to the data analyzed by AleaSoft. These first days of July have been marked by an increase in production with coal, at the expense of hydroelectric production that has seen its reserves to stop growing due to the seasonal decrease of rainfall in summer, but even so, they are at 113.6% of the average of the last ten years. The reconnection of the Vandellós II nuclear power plant to the grid is imminent. Initially scheduled for early this week, it has been postponed until Saturday, for the time being. About the Spanish nuclear power stations, the government has made public its will to progressively close all the power plants as they reach 40 years of life. This would lead to the closing of the last nuclear power plant in the peninsula in 2028. Regarding coal-fired power plants, the government’s intention is to have closed half of the current plants by 2020. 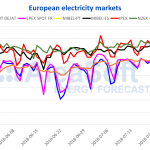 The prices of the main electricity spot markets in Europe remained high since the beginning of this month of July, with Spain, Portugal, the United Kingdom and Italy as the most expensive ones above 60 €/MWh, and France, Germany and the Nordic countries in a lower price band, just above 50 €/MWh.